Wolfenstein: The New Order continues as the ninth installment in the game series and a direct sequel to 2009’s Wolfenstein. This single-player, first person shooter experience features an unlimited weapon inventory amid an alternate world set in 1960 where the Nazis won World War II as a familiar U.S. OSA (Office of Secret Action) agent tries to stop the antagonists amid seven overall missions and several story chapters. Wolfenstein: The New Order gives players another quality first-person shooter experience with touches of sci-fi, horror, and stealth along with a Doom BETA invitation (PS4, PC and Xbox One). 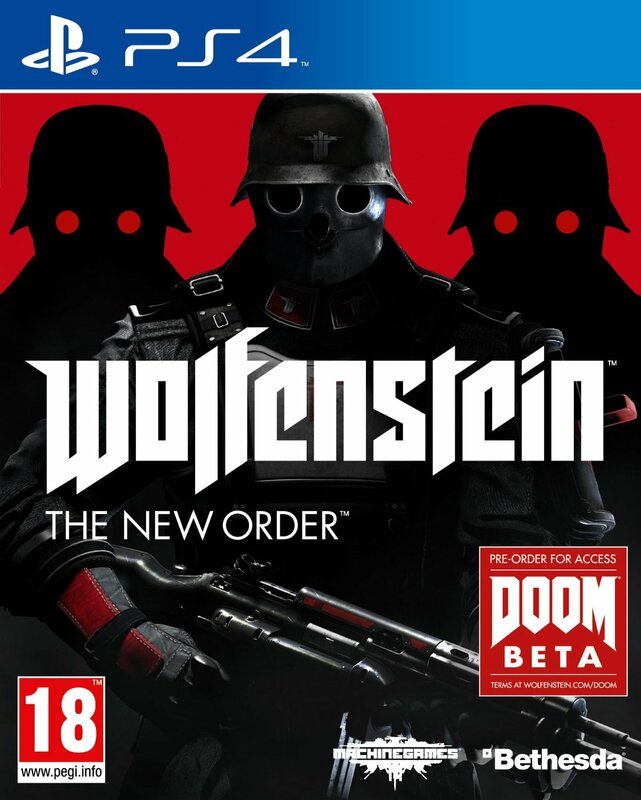 Developed by MachineGames and published by Bethesda Softworks, this latest Wolfenstein installment uses proprietary game engine id Tech 5 (players won’t see the Id label). Veteran player nostalgia from the classic Wolfenstein games stays intact thanks to a strong story and new/enhanced action mechanics. Good characters are varied and well-developed in the story that forges a Nazi-controlled alternate history, so the choice for one player only experience here (no multiplayer component) works well. Players uncover some creative scenarios that add unpredictable paths and demand extra attention. Developers inject more humor than previously seen in this game series, but make no mistake, this harrowing story can equal the same emotional devastation as the weapons do. Protagonist and Army Ranger William “B.J.” Blazkowicz, voiced by Brian Bloom (Batman: Arkham Origins, Marvel Heroes) first takes on the Nazis in World War II in 1946 as the story then moves to 1960 where the antagonist General Wilhelm Strasse (a.k.a. Deathshead), voiced by Kaspar Eichel, gets the advantage over the Allies with special technological advances. Blazkowicz wrestles with the remaining world then seeks other resistance seeking parties. As Blazkowicz discovers vat zee nastee Germans are up to, the violence is graphic, but develops his character and others. Blazkowicz’s facial features have modernized, but have not changed much from the 1992 original Wolfenstein game. Developers accelerate his character development by using his audible inner dialogue, which has a substantial impact without creating a negative element amid this survival-focused storyline where every encounter adds real emotion and tension. On the action side, players always have something to destroy or shoot at. Enemy forces include a mixture of humans, super humans, paranormal creatures, robots, dogs, and robotic dogs (a.k.a Panzerhunds) as well as partially destructible environments amid tight areas and epic, wide open spaces. Developers wisely added stealth, strategy and a dual-timeline/character storyline options for some variety. The dual choice enhances the replay value, but is pretty minimal on the character action since it only distinguishes between a lock picking and an electronic hotwiring specialty action. The actions are well paced without paralyzing the gameplay. The M rating is definitely warranted here, but does not negatively affect the overall experience. For example, the paranormal and occult elements add some unpredictability into the storylines. The standard first-person shooter view is great with decent interfaces and fluid movements. Avoiding objects when in a hurry or under duress can become a bit challenging, so it’s important to master the system. Quick slides, jumps, and leans represent the basic actions while players get additional help from special interactions like grabbing choice weapons from their stationery turrets. Effective mechanics make players feel intelligent and can empower some high quality gameplay. Developers achieve a nice balance here by challenging players without frustration or overwhelming tasks. The optional tutorials/help screens help avoid unnecessary trial and error though player decisions factor into the challenge level as well. Beyond the obvious difficulty level choice, players must carefully consider their health pack frequency. Overcharge health packs put players over 100%, but eventually dwindle down, so some short-term strategy includes knowing where the enemy waves are and checking the location maps. Stealth challenges are also considerable, but are relatively easy thanks to a simple mechanics. The stealth gameplay combines with locating skills where players can target high-ranking enemy officers and certain characters that would alert reinforcements with alarms. Visuals display the distance to them in the upper left screen (often multiple distances depending on current locations), but not their exact location. Once at the location, players can press the displayed button for a hand-to-hand takedown or try a well thrown knife or suppressed pistol shot. The weapon cache system lets players carry all their guns at the same time (a nice “old school perk”) and includes assault rifles, grenades, and shotguns. Weapons have secondary fire to pack an extra punch, such as shrapnel rounds for shotguns. Most weapons also work in both hands, which is where the personalized perk system comes into play. Instead of leveling up skills, players progress through a specific order that rewards with additional stealth and combat abilities. This system can feel like a forced tutorial at times, but adds some nice challenges as developers concentrate on appropriate goals. This system underwhelms by not rewarding players with significant perks – only slight improvements in ammunition capacities, etc. Weapon upgrades are helpful, especially the special shotgun shells that can ricochet. The Laserkraftwerk laser cutter seems like a great dual option as a tool and weapon, but, like picking up items, are not an automatic action and become cumbersome especially when you have to spend extra time with specific movements. Players strategize more about grabbing items and optimize their laser cutting skills (usually to physical progress through environments or find hidden items), but it’s an inconvenient choice that only adds extra time to the gameplay. A nice combat balance except for the boss fights. Boss challenges (usually against robots or other freakish creations) are a bit odd because the damage players cannot always see if they are causing damage. Players basically have to go all out and aim at target areas intuitive to them, which draws from other FPS game knowledge. Better aiming mechanics would be nice here, but effective weapons like the tesla grenades that stun, get the job done. Intel is always plentiful, so grab any selectable papers for helpful hints. Players can always pause the game for hints, summaries, and other helpful information as well as weapon setups and other important logistics. Unlockables boost the replay value and provide helpful items in battle. Rewarding alternate route reveals add some problem solving challenges. The visual design usually impresses on multiple levels except for a particular interior sequence in a train where Blazkowicz encounters two Nazi characters playing cards have a slightly an odd appearance, particularly their skin and hair. The lighting, shadows, close-ups, dizzying camera angles and cutscenes create high quality environments that drives players into the emotional story lines, which also include some surprise locations. Some locations seems oddly vacant and empty, which distracts a bit from gameplay because players would assume these locations would be bustling with activity from various people, vehicles, and objects. This FPS gem matches perfectly with the hard-driving musical score composed by Mick Gordon and Meshuggah lead guitarist Fredrik Thordendal. This collaboration reportedly produced over six hours of music, which eventually lead to the soundtrack that has an overall time of 51 minutes and 45 seconds. Wolfenstein The New Order boosts the first person genre it helped found while walking the fine line between old school nostalgia and meaningful improvement/enhancements for the players. Be sure to check out the end of the credit sequence. Wolfenstein: The New Order is recommended (*** out of four stars) and also available on PC, PS3, Xbox 360 (four discs), and Xbox One for $59.99. NOTE: The Doom beta is only for PC, PS4, and Xbox One. The prequel Wolfenstein: The Old Blood is also available. This entry was posted in Video Game Reviews and tagged Michael Siebenaler, Mike Siebenaler, Tall Writer, video games, Wolfenstein, Wolfenstein The New Order. Bookmark the permalink.